The Paris Climate Conference, officially known as the 21st Conference of the Parties (COP21), will be held November 30 – December 11 in Le Bourget, France. The goals for the conference, as stated by French Minister of Foreign Affairs Laurent Fabius, include establishing a legally binding international agreement to limit global warming to 2 degrees Celsius. In preparation for the conference, participating countries are submitting Intended Nationally Determined Contributions (INDCs) that state their emission targets and provide high-level outlines of how the targets will be achieved. As of November 18, 2015, 140 INDCs have been submitted representing 167 countries. Forest management is a component of many of the INDCs with approaches including afforestation, reforestation, reduction in forest degradation, and increased stocking explicitly mentioned. The Paris Climate Conference builds on 25 years of international effort to establish an effective and equitable approach to addressing climate change. The United Nations Framework Convention on Climate Change (UNFCCC) was adopted in 1992. The UNFCCC establishes the objective of “stabilization of greenhouse gas concentrations in the atmosphere at a level that would prevent dangerous anthropogenic interference with the climate system.” Commitments established in the UNFCCC include formulating and implementing national programs to reduce and sequester greenhouse gas emissions. The Copenhagen Accord of 2009 established the goal of limiting global warming to 2 degrees Celsius and acknowledged that “deep cuts in global emissions are required according to science”. The draft international agreement to be considered at the Paris conference references forests primarily in the context of two competing approaches to minimizing deforestation in the tropics. The two approaches explicitly mentioned in the draft agreement are Reducing Emissions from Deforestation and Forest Degradation (REDD) and the Joint Mitigation and Adaptation Mechanism (JMA). REDD is a market-based approach to creating financial value for the carbon stored in forests. JMA is a non-market-based approach to integrating climate change mitigation and adaptation through linking of a range of factors including agriculture and forestry, protection of biodiversity and support of indigenous populations. REDD has been tested in a variety of tropical nations and has proven to be difficult to implement due to a number of factors including insufficient funding, questions on tenure and ownership of forestland, insufficient or unstable governance structures, and lack of sufficient on-the-ground technical expertise. One possible outcome of the Paris conference is an increase in support of the Green Climate Fund that could be used for direct payments in support of either REDD or JMA. The INDCs submitted prior to the conference include a broad range of commitments across sectors that include energy efficiency, transition to low-carbon energy production, improved transportation efficiency, and use of forests to enhance carbon sequestration and storage. In preparation for the Paris conference, the United Nations Environment Program has released their 2015 Emissions Gap Report. The 2015 report, which is the most recent annual assessment of progress towards meeting the global 2 degree goal, includes an analysis of the potential for greater forest-related mitigation. 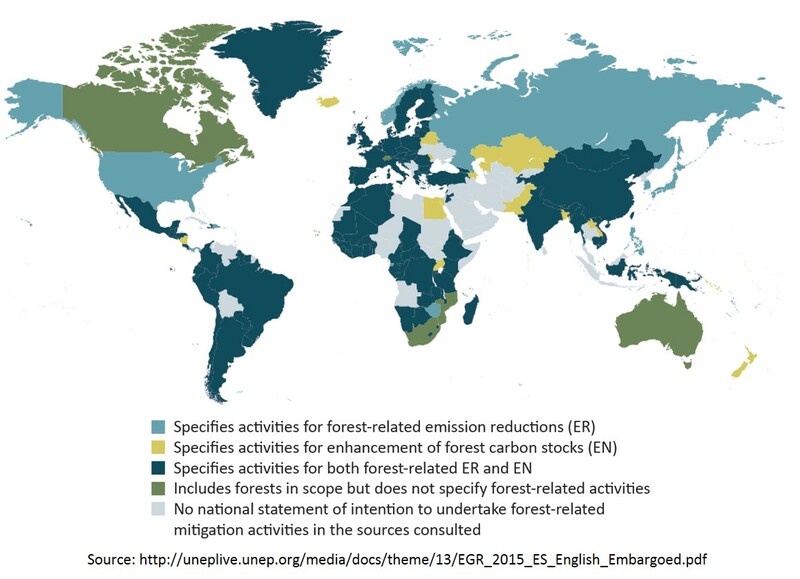 The following map from that analysis is a depiction of national intention to undertake forest-related mitigation activities through the INDCs and several related previous commitments. China has committed to increasing forest stock volume by 4.5 billion cubic meters compared to 2005 levels. India will create an additional carbon sink of 2.5 to 3 billion tons of CO2 equivalent through additional forest and tree cover by 2030. Honduras includes afforestation/reforestation of 1 million hectares of forest by 2030 in their commitments. It is likely that forest management and carbon market opportunities will also be influenced by efforts to reduce emissions in other sectors. The U. S. Clean Power Plan (CPP), for example, is a key component of U.S. efforts to reduce emissions from existing power generation facilities. Under the CPP, states and regions are allowed to establish emission trading programs as one component of compliance. This potential expansion of the market for carbon credits could provide incentive for additional afforestation and forest management to maximize carbon sequestration and storage. While it is not likely that any of the decisions taken at the Paris conference will directly impact the commercial forestry industry, the international agreement that will be negotiated and the INDCs will influence land use decisions and the role of forests in mitigating and adapting to climate change for many years to come. As human population continues to grow and living standards improve, existing tensions between different land uses, including food production, carbon sequestration and storage, protection of biodiversity, and production of wood and fiber will be exacerbated. How these land use questions are resolved, in conjunction with changing carbon credit markets, will alter the policy and economic contexts that forest owners and managers operate in. BECCS is an unproven technology so it is not possible to know at this point the feasibility of large-scale deployment or the potential role of forests as a fuel source. Regardless of the specific outcomes of the Paris conference, it is safe to say that forests will play an increasingly important role in meeting multiple goals. Manomet will provide Climate Smart Land Network members with follow-up analysis at the conclusion of the conference. 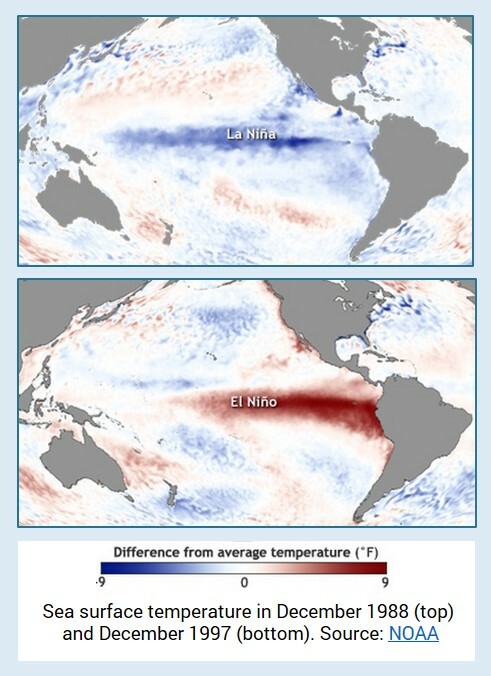 El Niño is the warm phase of an ocean-atmosphere circulation pattern in the equatorial Pacific Ocean, known as the El Niño-Southern Oscillation (ENSO), which is responsible for a large fraction of the year-to-year variability in global climate. In previous CSLN bulletins we have highlighted the role of ENSO in shaping short-term variability in global temperature. The trade winds typically blow east to west around the equator, pushing warm surface ocean water so it piles up in the western Pacific near Indonesia. When these winds strengthen, it causes upwelling of deep, cold ocean water near the west coast of South America and we see below-average surface ocean temperatures in this region, also known as a La Niña. When these winds weaken (every two to seven years), the warm water “sloshes back” toward South America leading to the above-average surface ocean temperatures of an El Niño event (see figure, right). Global Temperature – During an El Niño, enough extra heat is transferred from the ocean to the atmosphere that average global temperatures can rise for a period of time, which is why there is a good chance that this year will beat 2014 as the warmest year on record if there is an El Niño. 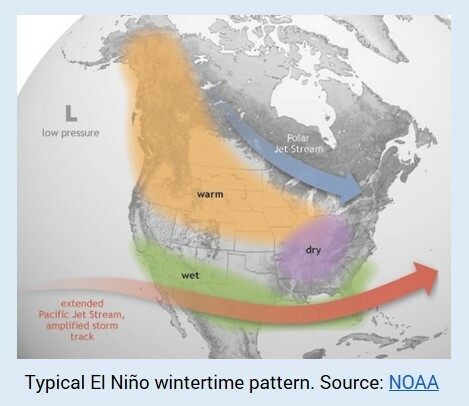 Regional Weather – The domino effect caused by the warmer ocean surface during an El Niño leads to a shift in the jet stream that has implications for weather patterns in the United States, with the effects here predominantly felt in the fall and winter months. More severe weather in the southern U.S.
Forest Productivity & Fire Frequency – Weather changes associated with ENSO affect plant productivity and these changes cascade up through the food web shaping entire ecosystems. For example, El Niño years can flip the Amazon region from being a carbon sink to a carbon source, wetter periods during La Niña episodes have been linked to more successful seedling establishment in some Australian tree species, and ENSO-induced droughts contribute to increased wildfires in some places. Fire regimes in the western continental U.S. and western boreal forests of North America are particularly sensitive to ENSO-driven climatic change, especially the interaction of ENSO with another climate phenomenon known as the Pacific Decadal Oscillation (PDO). Taken together, these climate patterns explain a notable portion of the fire history in these regions. ENSO/PDO activity drives fire behavior by influencing fuel moisture. Wildfire frequency, severity, and total area burned are affected by seasonal precipitation, temperature, and atmospheric conditions (specifically the frequency of blocking high pressure systems and extreme fire weather), but the impacts of ENSO are variable and regionally-specific. For example, El Niño typically brings wetter winter-spring conditions to the Southeastern and Southwestern U.S. and the area burned is reduced. In contrast, El Niño events tend to bring warmer and drier winter-spring conditions to the Pacific Northwest and the result is increased wildfire activity during those seasons, but it also typically leads to more precipitation in the summer, coinciding with fewer large fires in the warmer months. “There is an approximately 95% chance that El Niño will continue through Northern Hemisphere winter 2015-16, gradually weakening through spring 2016” (NOAA CPC). These estimates are based on several indices generated from monitoring air pressure changes, sea surface temperatures, outgoing longwave radiation, and wind in the equatorial Pacific. Each of these variables capture a component of the ocean and atmospheric dynamics that are part of the ENSO phenomenon. How might climate change influence future ENSO events? There are a number of ingredients that combine to produce ENSO (atmospheric circulation, ocean convection, cloud cover, etc.) and climate change will affect all or most of these, so it is reasonable to expect that ENSO may change in the future. While some recent research suggests there is a chance for an increase in extreme El Niños, at this time it is difficult to say what the net effect will be on the strength and frequency of El Niño events. One thing that is certain is that climate change may enhance some of the impacts from ENSO events, e.g. warmer average temperatures may turn an El Niño-induced dry period into severe drought, or the biasing of precipitation toward heavy downpours in a warmer atmosphere may exacerbate flash flooding risk in areas where El Niño brings increased precipitation. Implementing simple and cost-effective forest monitoring is an important part of climate-smart management, as it helps practitioners move beyond anecdotal observations to real baseline data and provides a mechanism for feedback over time. A helpful one-page document with a summary of these ideas and some example monitoring protocols can be downloaded here.